In the early 2000s, everyone dressed like The Strokes, even the bands they shared the stage with. Skinny jeans, a slim cut blazer or hip leather jacket, finished with skinny tie or vintage T-shirt, was the official uniform of bohemian cool. The fuzzy post-punk revival that took the world by storm is recently in the rearview and we are just now in a position to look back on the era of effortlessly chic New York City cool. Though there are many figures in the music and fashion world swirling around this era, if you look at its epicenter you find The Strokes and designer Hedi Slimane. The publication of Lizzy Goodman’s Meet Me in the Bathoom marks the first comprehensive look at the New York rock scene in the first decade of the 21st century. The book has sparked a conversation about what was special about that particular moment in cultural history. Specifically, critics and fans are looking back and wondering if the end of this era marked the end of the rock star. From a fashion perspective, then, it is safe to wonder if the end of this era also marked the end of rock star fashion (at least, as we knew it—shouts to the burgeoning band tee market). Strokes guitarist Nick Valensi told frontman Julian Casablancas, “What’s your problem? Just dress every day like you’re going to play a show.” This began a commitment to fashion in the band that would always be intrinsically connected to their image. The Strokes would go on to contribute numerous items to the American male’s closet. White belts, white boots, skinny ties, denim jackets, aviators, Chuck Taylors and Italian leather shoes would all see a resurgence or a full-blown style moment thanks the Strokes and its peers. But, if there is one enduring look that the Strokes gave the world, it was skinny jeans with a blazer or slim fit leather jacket. The look was at once high and low fashion, and was best accented with a mop of unkempt hair. If The Strokes were “Patient Zero” in this fashion moment, the group wasn’t without its peers. Interpol, also a post-punk outfit, made their debut in 2002. They cultivated a cleaner, more unified look than The Strokes, usually taking the stage in suits. Frontman Paul Banks explained, “It’s more like a uniform for us. It started simply by the fact that when the band began I had a job that I hated and I remember going to work a gig and thinking that this gig is what means something to me so I’m going to make myself presentable.” Though they were more consciously dapper and clean-cut than The Strokes, they similarly cultivated the slim cut look. If you set the Strokes at one end of the spectrum with their melange of thrift store cool and Interpol at the other with their more formalized look, their contemporaries tend to fit somewhere in between. The Hives also wore suits on stage. 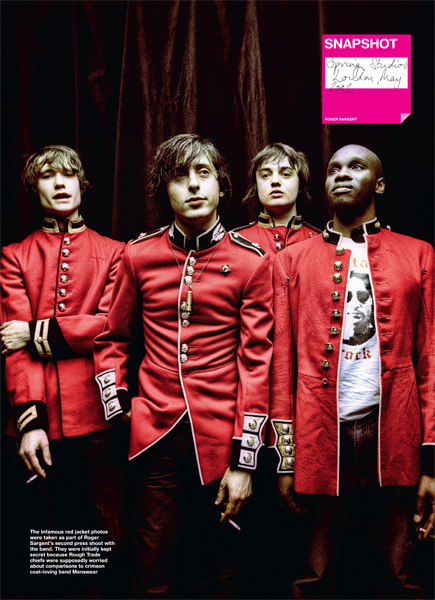 The Libertines accented their secondhand fashions with military jackets and garments with a distinctly british flair. Franz Ferdinand also preferred a slim, tailored look. The White Stripes’ Jack White often wore skinny jeans and tailored suits in the band’s signature white, red and black, throwing in a Western shirts or cowboy hat here and there. The men of The Yeah Yeah Yeahs could have filled in for The Strokes without most fans taking notice. Much like The Strokes, Slimane drew on the New York of the ‘70s and ‘80s. Slimane’s clothes and shows evoked “pre-Berlin Bowie, The New York Dolls, The Factory and early Robert Mapplethorpe.” Like the music, the fashion of the era spoke to a nostalgia for an earlier time in New York’s history, something that was slipping from their grasp in the face of gentrification in the new millennium. At the age of 28, Slimane landed his first creative director gig for Yves Saint Laurent’s male line. His last work there, the Fall/Winter 2000 collection, featured his first androgynous silhouette. The trends that Slimane would bring into the mainstream were already taking shape; ideas like combining a “daily tux jacket with skinny jeans” were already bouncing around in his head and making their way into his shows. Later that year, he arrived at Dior Homme. Dior is where he would mount his takeover of the men’s fashion world. He continued to make clothing for an ultra-thin silhouette and he recruited the bands he knew to help him. Slimane’s name is all over October 2004’s issue of Spin Magazine featuring Franz Ferdinand on the cover and filled with pieces on The Strokes, The White Stripes and Interpol. His clothes are all over the bands. His second artistic love—photography—focuses on these bands too. Shortly after this style and that sound hit a high point, it started to slip away. Gentrification won as it always does. Bars closed. Bands broke up. New York changed. It feels appropriate that The Strokes began a five-year hiatus between albums in 2006 and Slimane left Dior Homme in 2007. Though for the next few years, American pop culture would enjoy the fruits of The Strokes and Slimane’s labors, but their scene and their moment was over. It’s challenging to fully grasp the legacy these bands and their clothes left on the culture. That dingy-yet-dapper rock ‘n roll look isn’t big today (at least, not in the way it was during the mid-2000s). But as far as lasting impact, men are still comfortable wearing a slim cut, even if the street style of the moment is a pretty far cry from the leather jackets and skinny ties of the era—especially as wide-leg trousers and sport-inspired techwear are closer to the trends of the day. Now that you see androgynous (or certainly “gender neutral”) offerings from labels across the board, it seems he has a point. Slimane returned to Yves Saint Laurent in 2012 and stayed until 2016. He has kept himself busy with various art and photography projects as well. The Strokes released albums in 2011 and 2013 and still perform together sporadically. While both Slimane and the Strokes are still working at their respective crafts, it’s likely that the mid-2000s will remain the high point of their careers. Rarely do you get a halcyon cross-cultural moment so entrenched in art of the past, present and future; New York’s post-punk revival in the first decade of the new millennium was just that moment. Unfortunately, New York City, as they knew it, is never coming back.